Choosing a floor plan is obviously a crucial decision. My advice for this topic: really think about your lifestyle and how you want to live in your new home. 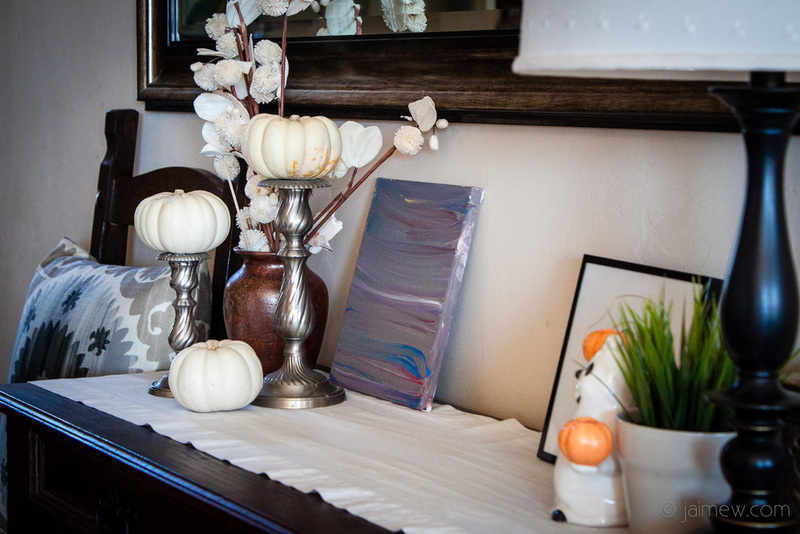 One of my biggest pet peeves in any home is wasted space (formal living room with plastic seat covers, anyone?). It also helps to consider how long you plan to be in this home and what your lifestyle will be like over those years. Case in point: we’re considering this the “teen years” home. We have at least 10 more years of kids in the house, and we really want our kids and their friends to feel comfortable hanging out in our home during the high school years. We wanted lots of open space, but a defined kid hang-out area and an area the adults could use for relaxing, entertaining, and watching tv at the same time. We ended up using an existing Pepper Viner floor plan, which saved us thousands of dollars that we would have had to pay an architect to design a home from scratch. Pepper Viner had built this home as a model a few years ago, so we were lucky enough to have been able to walk through it in real life, which was a huge benefit in getting a feel for the layout. Unfortunately that’s not always possible, but you can always spend some time touring model homes to get a feel for the size of rooms and layouts you like so that when you’re viewing floor plans, you have an idea of what you’re looking at. The floor plan we chose has a large open living/dining space, which we will use as the kid area and for extra dining space when we entertain – but our approach to this space will be casual, not formal. 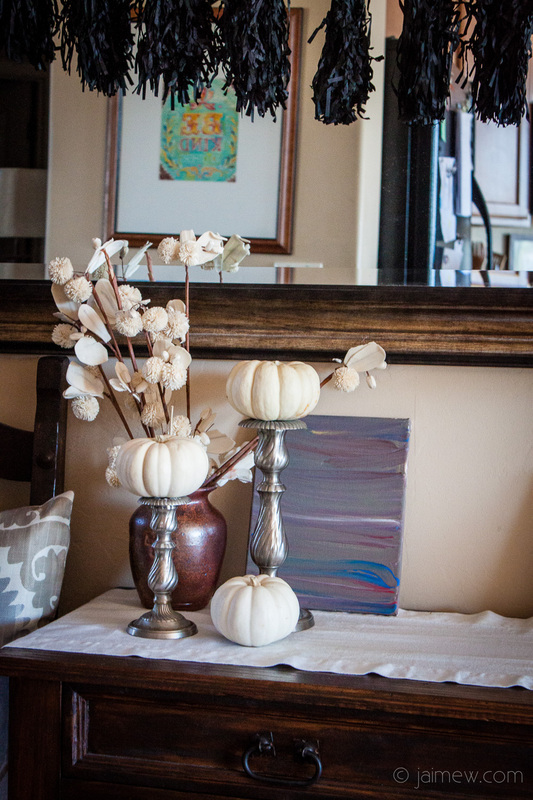 Formal spaces just aren’t necessary for the way we live and entertain in our family. The kitchen is open to the family room, and I love being able to cook and work in the kitchen and still be with my family. There are doors from all of these living spaces onto the back patio, which is perfect for Arizona since we spend a lot of time outside. We did want to make a few changes to the plan, so we went to the architect who designed the original plan to make those modifications. We added a walk-in pantry – it’s more spacious than the cabinetry that had been designated as pantry space in the original plan. Again, this is an example of thinking about how you like to function in a home. In my case, I like deep, open shelves where I can see everything all at once. I not only store a lot of food (I like to stock up at Costco) but I also store big appliances like my crock pot and blender and large serving dishes in my pantry. We like to entertain and I like to make it easy on myself. To eek out the space for the pantry, we had to lose some cabinet space, but it was worth it to me. Another change we made was eliminating a small door and window along the back of the open living/dining area, and instead installing a large 18-foot sliding door. This required some engineering on that load-bearing wall, so again, we need the expertise of the architect to map that out. In making that change, we realized one of the patio columns would be right smack in the middle of the view from the door, so we had him reconfigure the column placement as well. 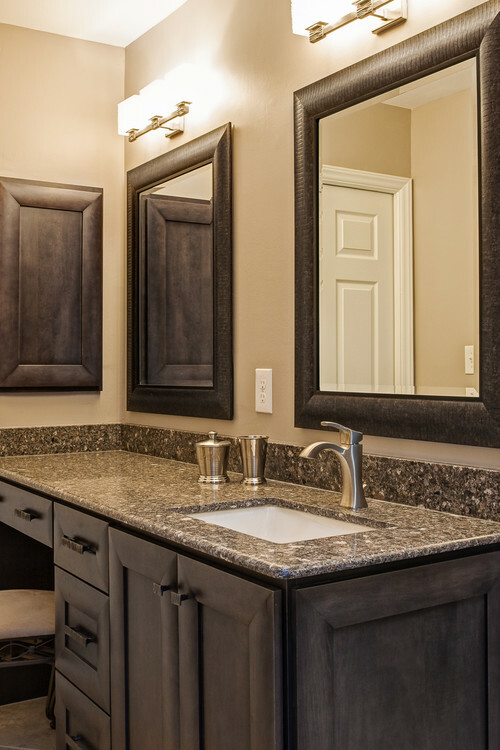 Overall, choose a floorplan that suits the way your family lives instead of trying to force yourselves to function in a space that doesn’t make sense. Consider whether you entertain, host houseguests, how much storage you need, and how much maintenance you're willing to deal with. Once you have that basic layout in place, that’s when you can have some fun choosing finishes and touches to really make it your own. More on that soon! With building a house comes SO MANY decisions. 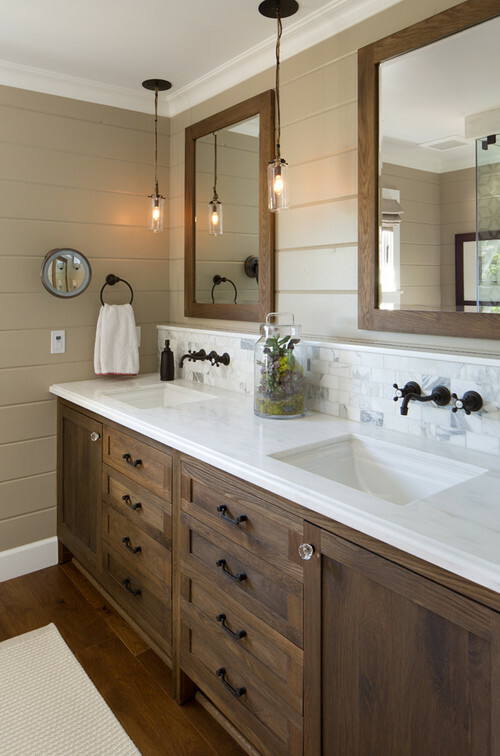 One of the big debates I had was deciding on the finish for the plumbing fixtures (faucets, shower heads, etc.). 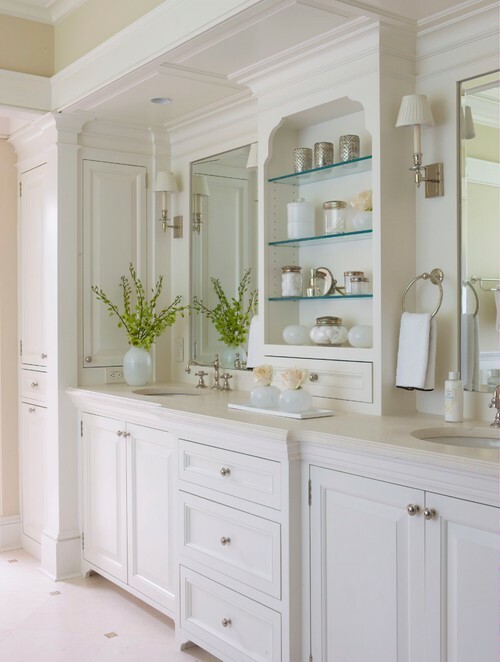 Part of the struggle was that I wanted to carry that finish throughout the house — towel bars, door handles, hardware, etc. — so it wasn’t going in just one place. During my debate, I posted this photo (--->) on Facebook and Instagram, and I had to laugh, because I don’t think I’ve ever gotten such a response on anything I’ve ever posted before. 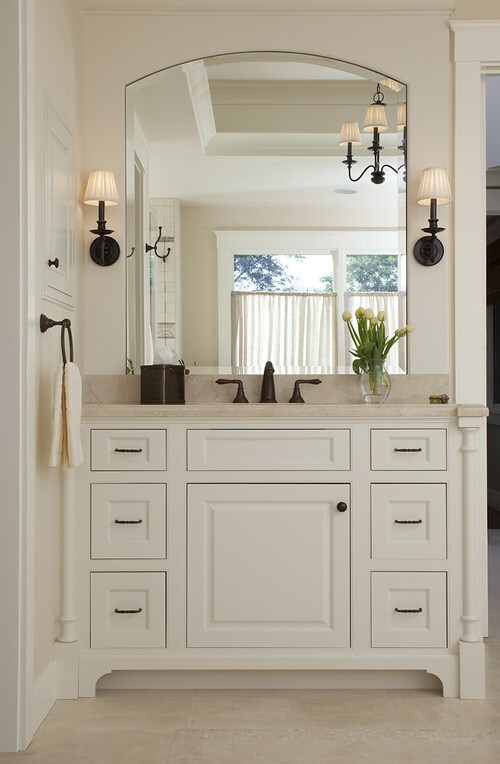 People are PASSIONATE about their plumbing fixtures. We’ll have white cabinets, and I wanted something classic that I won’t hate in a few years. The trick, I suppose, is that it’s hard to know now what you’ll hate then. The majority of responses to my informal survey were in favor of brushed nickel or oil rubbed bronze. I like them both. I had thought about the beautiful champagne bronze finish — sort of the matte gold that is so popular right now — but vetoed that because it’s pretty pricey, especially when using it on everything, and I wasn't completely sure I would continue to love it for years to come. The winner? Brushed nickel. Several of my friends who have oil-rubbed bronze warned me that the finish wears off, so that decided it for me. Added bonus? Brushed nickel doesn’t show water spots and fingerprints as much as shinier finishes, and with two kids, every little bit helps. And since it’s been around for a while, there are tons of options for brushed nickel — different styles, price points, etc. In a future post, I'll write up a list of links to tons of places where you can comparison shop for fixtures. 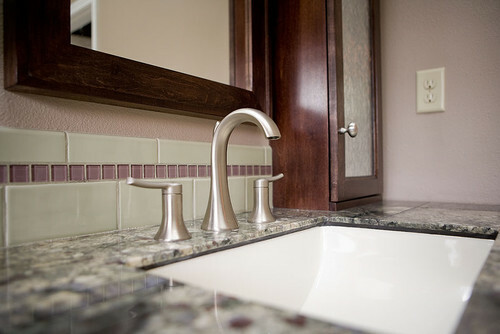 We ended up choosing Kohler faucets and are buying them through Ferguson Kitchen & Bath, the vendor used by Tucson Plumbing, who is doing all of the plumbing in our house. 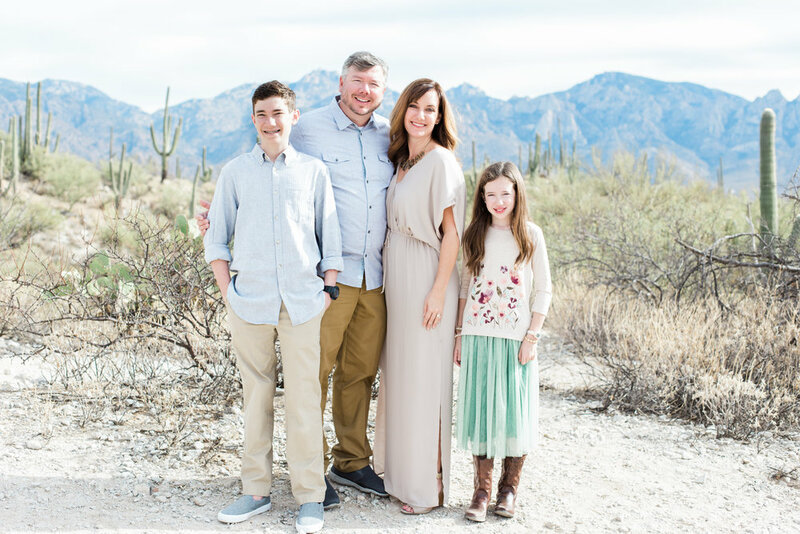 Chad has been working with Tucson Plumbing and Ferguson for years through his job with Pepper Viner Homes. 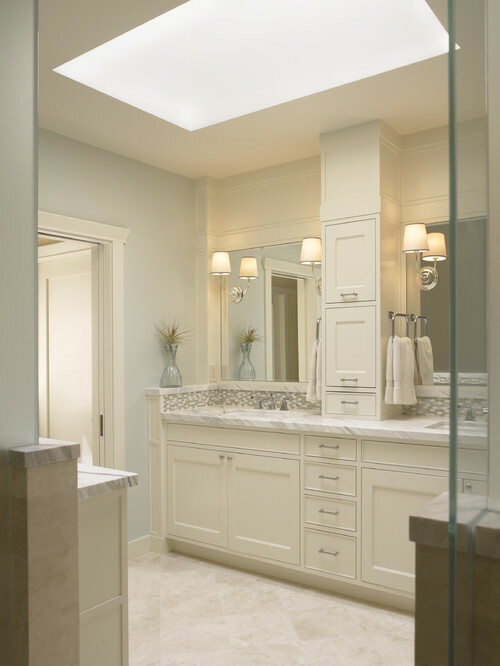 We’re so glad we were able to source our choices through a local vendor, and we love that Kohler has a lifetime guarantee on all of their items. Once everything is installed I'll post some pictures! Which finish do you like best? Any strong opinions out there? 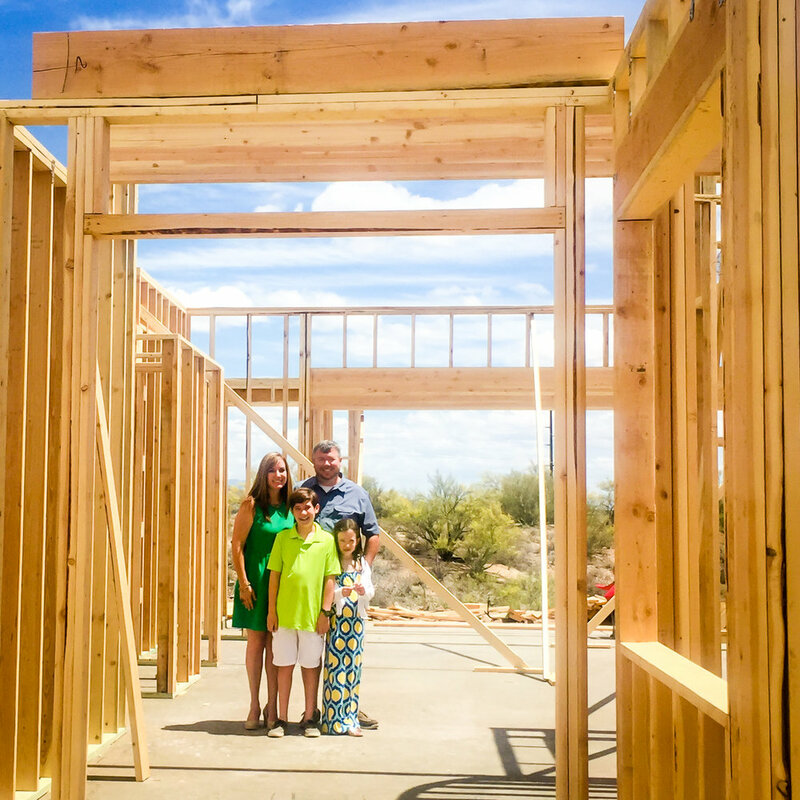 Want to read all of our homebuilding posts? Find them here! I told you I’d fill you in on the lot we ended up with – here goes! After months of searching, then having not one, but two lots under contract and then fall through for various reasons, we ended up putting in an offer on a lot we had previously disregarded. It was in a great location, but on a busy road, and it looked like it might be a tough build with some hills and lots of rocks – not to mention that we couldn’t see it that well from the road and there wasn’t a real access to it to check it out in more detail. As our frustration grew with the lack of options in our price range, we decided to take a closer look. Chad called me over to his computer one day to look at the Google aerial view of the land, and he showed me where he thought there was a ridge set far back from the road that was flat enough to build on. We went out there and walked the lot (well, hiked the lot), one thing led to another, and we decided to place an offer. We asked for a 90-day closing – I wasn’t happy about that because we had waited for so long and was growing impatient – but Chad insisted we needed plenty of time to do our due diligence and make sure we could build the way we wanted to and that there wouldn’t be any huge surprise costs associated with that piece of land. He was right. It took just about the whole 90 days to do the research. He had his land development guy go out there and consult with him, and they agreed they would need to “move some dirt” (read: bulldoze literally tons of dirt) to flatten the build area, but that it could be done. The soil had to be tested to make sure a septic tank would work. The architectural review committee of the homeowners’ association had to approve our plans. The municipality zoning had to approve our site and house plan within their requirements. Fun fact, for example: our roof was NINE inches too tall - so we had to redesign the roof trusses to get under the 18-foot zoning requirement. They also inspected the lot to see how many trees we would need to move to build – and the city requires us to plant new trees to replace them. Because it would take us a few months to close on the lot, we did as much as we could prior to closing so that we would be able to hit the ground running and start construction as soon as possible. While we were still in escrow, we finalized the house plans. We’re using one of Pepper Viner’s existing plans, but a few adjustments we wanted required architectural review and sign-off, so we went ahead and took care of that. We also submitted our site plan to the town so that we would have a permit to begin clearing the lot as soon as we closed – there is a fee associated with that, so we were taking a gamble that everything would go fine and we would, indeed, ultimately close on this lot. If the deal had fallen through, we would have been out that money. Chad also got the various subcontractors tentatively scheduled. Despite all of our well-intentioned planning, we did encounter a few delays out of the gate: it took more time than expected to clear the lot, so we lost a few days, but after waiting for years, I could handle a few days’ delay. The benefit to the hilly, not flat lot? We loved the beautiful views! Unfortunately we are located on the west side of the road, but we wanted our backyard to face east. Enter some creative site planning. We consulted with a draftsman and he worked on a grading plan that would include a long driveway up the hill, and an unusual but smart turn of the house – so our front yard won’t face the road like a typical house, but because of the way we’re turning it, our backyard will face east and we’ll be able to enjoy mountain views and afternoon shade – a big benefit in hot, hot Tucson. While the lot was in our budget, we’re pushing it a bit with the cost of land development. Now for the fun part – trying to recoup some of those costs in other parts of the house. Next up we’ll talk about some of the ways we’re saving money on construction of this house. My daughter's birthday was in August, and this year she requested a small family birthday party, which was just fine with me! 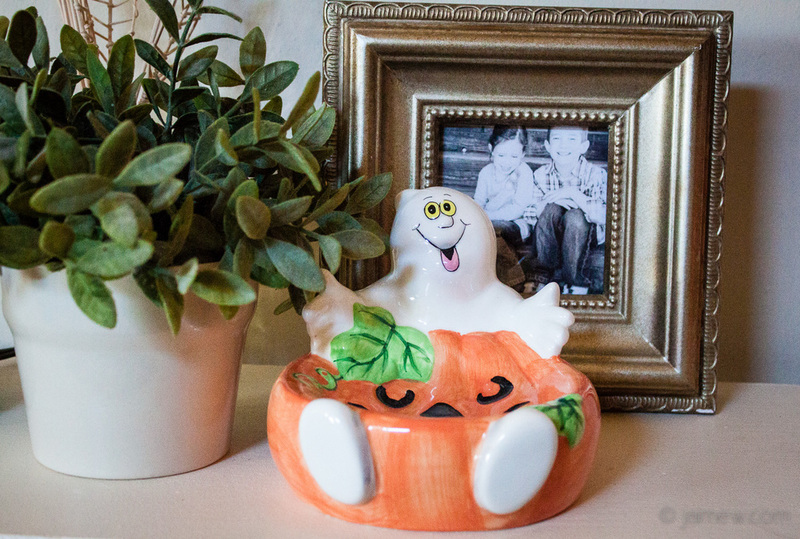 That gave me an opportunity to focus on some cute details without stressing over a big, expensive bash. 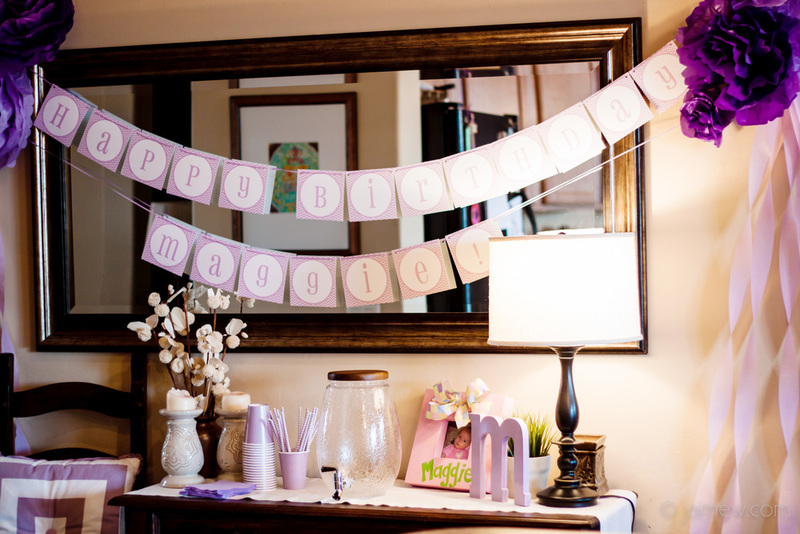 Maggie's favorite color is lavender, so we used that as our starting point. She asked to get a comfortable maxi dress to wear for the party, and when I came across this dress on Lolly Wolly Doodle, we decided to purchase it and use a chevron print in the decor too. If you're looking for cute girls' clothes, whether for a party or not, I recommend checking out Lolly Wolly Doodle's website and Facebook page - I love supporting another mom-owned business, and they have a fantastic success story about how they grew their business! 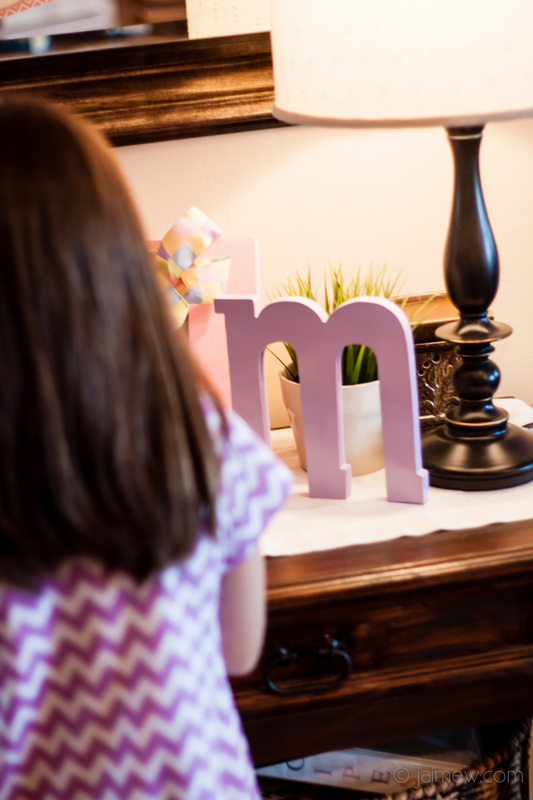 They'll monogram their items very inexpensively, so that adds a cute personalized touch. I designed a simple invitation that we emailed to the family - similar to this chevron invitation I'm now carrying in my Etsy shop - I'm able to customize it for whatever color scheme my clients need, so it's a really versatile design. 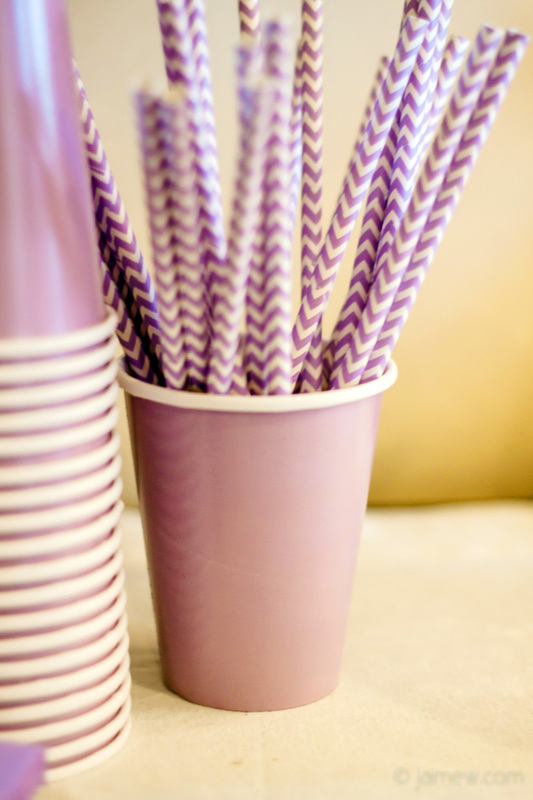 I got the chevron paper drinking straws from this Etsy shop - I loved that it was another Etsy seller from Arizona, and she has tons of color options and other cute items (treat bags, washi tape, twine) that are perfect for parties. Rather than ice cream, Maggie wanted a make-your-own sundae bar like Luke had for his birthday party earlier this year. It was a very relaxed get-together and we all had a great time - and I had a happy eight (!!) year old. For the cake, I bought the delicious chocolate round cake from Costco and just spruced it up with a bunch of sprinkles and a topper I designed to coordinate with the theme. 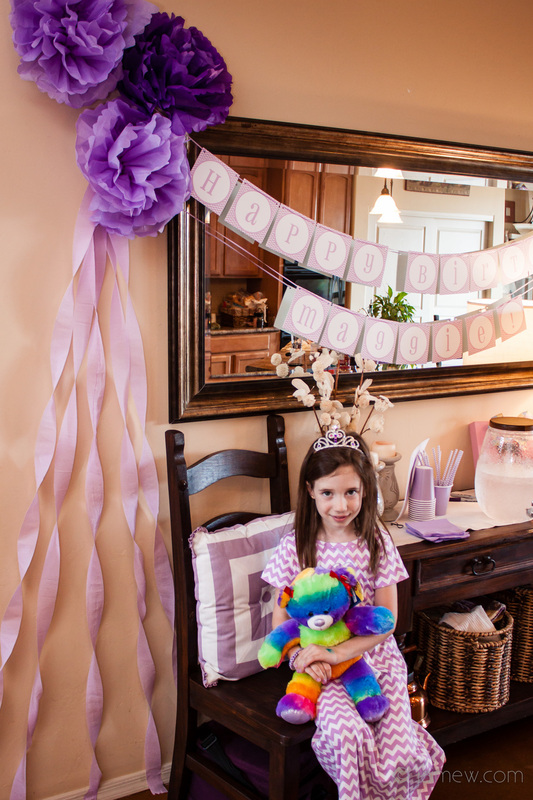 We placed it on a dessert table decorated with a banner and tissue paper pom-poms. 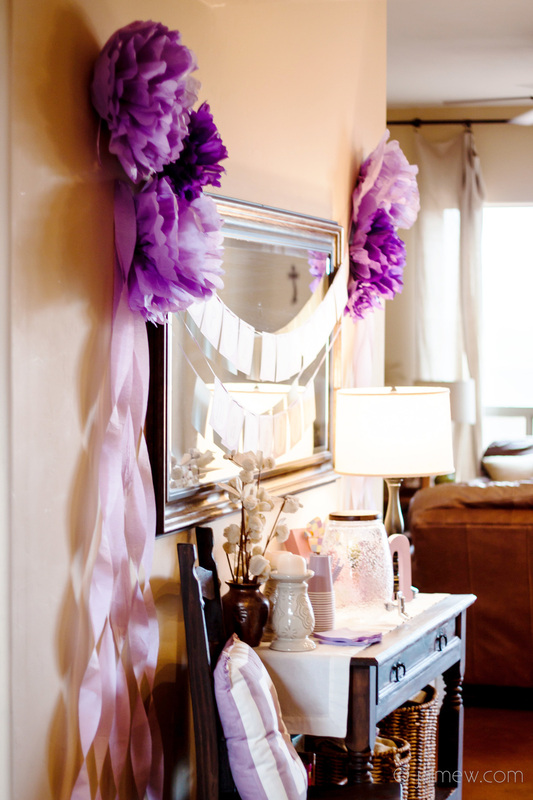 I purchased fairy wings, tutus, and wands for the girls to wear at the party and take home as favors (comment below if you want the source - great prices!). It was fun, cute, and a great memory for my daughter!